With the right app, our phones can become almost any device we need, and Light & Motion is taking a similar approach with its new GoBe flashlight. 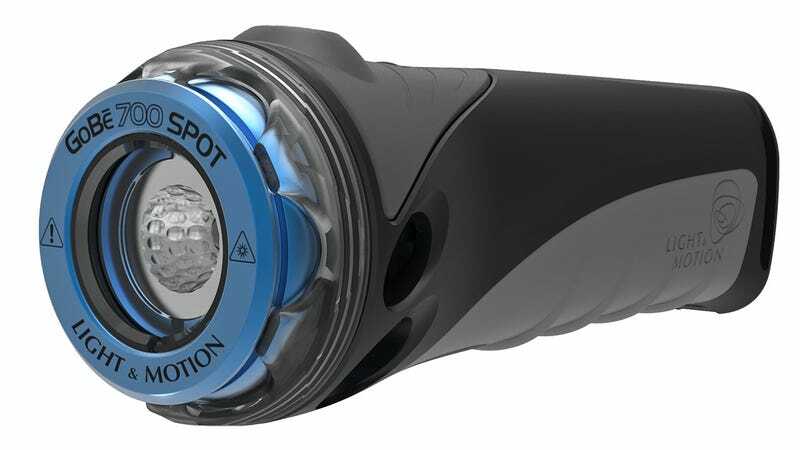 Except that instead of software, it uses a set of six swappable heads that allow you to customize the flashlight's beam for specific needs—like a wide bright light when riding your bike in the city, or a soft red glow that protects your night vision when hiking through the woods. Waterproof to almost 400 feet, the GoBe uses a built-in rechargeable lithium-ion battery that keeps the flashlight lit for up to 36 hours on the dimmest of its four brightness settings, while an indicator keeps you informed of when the battery is going to need a charge so you're not caught off guard. The six swappable heads provide varying degrees of brightness and spread, with some covering wide areas while others feature a focused spot ideal for nighttime searches. The more unique options include the Red Focus which uses a red-tinted beam to preserve your own natural nightvision, and the Nightsea which works more or less like an ultraviolet light to cause objects or plant life to fluoresce.